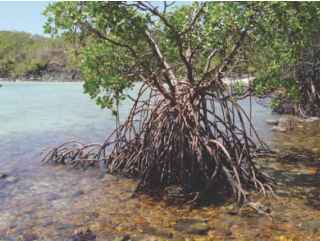 Mangroves are a diverse group of predominantly tropical trees and shrubs growing in the upper half of the intertidal zone of coastal areas worldwide. They are well known for their morphological and physiological adaptations for life coping with salt, saturated soils and regular tidal inundation, notably with specialised attributes like: exposed breathing roots above ground, extra stem support structures, salt-excreting leaves, low water potentials and high intracellular salt concentrations to maintain favourable water relations in saline environments, and viviparous water-dispersed propagules. Mangroves are often mistakenly thought of as a single entity. But, like coral reefs, mangroves are as functionally diverse and complex as the range of species, variants and morphotypes present at particular locations. Also, like coral reefs, they provide essential structure and habitat for a host of marine and intertidal species, including residents among their dense forests and complex roots, and as visitors with each flooding tide (Box 16.1, Fig. 16.2). Mangroves are also analogous in function to tropical rainforests, providing comparable canopy habitat for birds, mammals and insects. This overlap is reinforced by ancestral links between these plant habitats. But, despite the shared features, mangroves include specialist attributes and dedicated resident biota found nowhere else. Examples include specialist mangrove forms of the robin, mistletoe bird, mistletoes, grapsid crabs, molluscs, herbivorous insects, and numerous floral visitors. 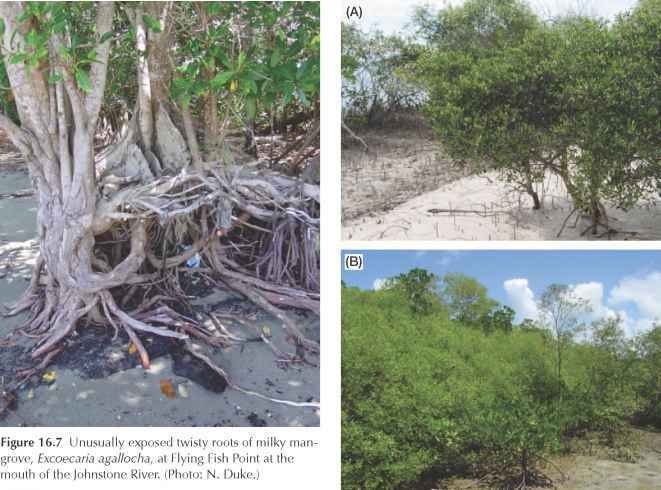 Mangroves are not a genetic entity, but an ecological system. Mangrove vegetation includes a range of functional forms, including trees, shrubs, a palm, and a ground fern. These generally exceed 0.5 metres in height, and normally grow above mean sea level in the intertidal zone of marine coastal environments and es-tuarine margins. 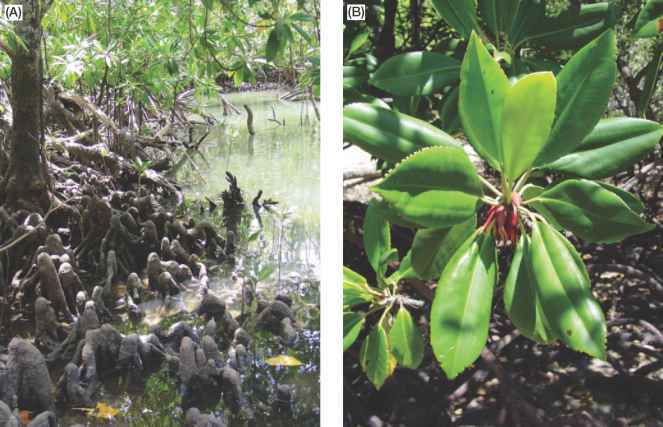 Mangrove plants do not come from a single genetic source, and the only plant families that are comprised exclusively of mangrove taxa are Avi-cenniaceae and Sonneratiaceae. Around the world, the total number of mangrove plants is around 72 taxa from 21 families, consisting mostly of angiosperms. Distributed along the GBR World Heritage Area, there are 39 taxa from 19 families (Fig. 16.1, Table 16.1), representing a significant portion of the worlds' genetic variation in mangrove plants, and most of Australia's. 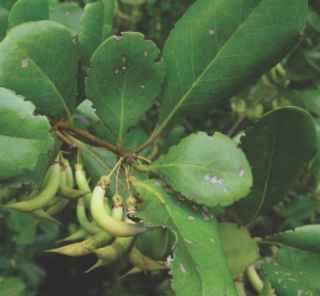 Some species, like Avicennia marina (Fig. 16.3), Rhizophora stylosa (Fig. 16.4) and Bruguiera gymnorhiza (Fig. 16.5), are widespread in the Indo-West Pacific region, while others, like Aegiceras corniculatum (Fig. 16.6), Ceriops australis, Bruguiera exaristata, and Diospyros littorea, are more restricted to the Australasian region. None are restricted solely to the GBR World Heritage Area. It is of interest also that Avicennia marina var. eucalyptifolia (Fig. 16.3) merges with the south-eastern Australian variety, A. var. australasica towards its southern boundary, south of the Tropic of Capricorn. 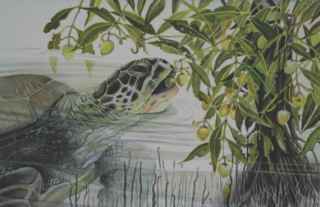 Green turtles seek out maturing mangrove propagules to include in their diets. Several observations come as evidence and clues of this previously unknown behaviour. It has been noted for some time that turtles frequent mangrove-lined waterways at high tide. They are also known for occasionally, as tides recede, becoming caught up in tree limbs and stranded on exposed mudflats. Firm evidence of feeding, however, has only recently been described. 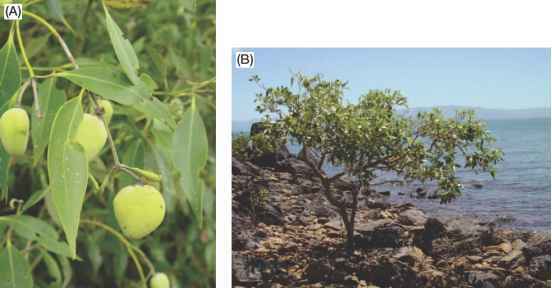 In 2000, Limpus and Limpus reported purposeful cropping of mature propagules of Avicennia marina in Shoalwater Bay. This has been further supported by observations of A. marina propagules within mature turtle guts interspersed with seagrass. The feeding behaviour to be interpreted from these observations is that some turtles feed on seagrass at low tide, and, for a short time at high tide, they take in the nutritious mangrove propagules. This behaviour is dependant on periods of higher tides and the distinct seasonality of propagule availability. However, the extent to which turtles seek out this occasional food bonanza is seemingly shown by more recent observations in Great Sandy Straits of some turtles purposely stranding themselves on mudflats near mangroves (risking predation and ignoring low tide feeding) to gather more of this previously unrecognised food source. and reef atolls, never falling below 60% presence and often above 80% and include: Avicennia marina, Aegiceras corniculatum, Bruguiera gymnorhiza, Excoecaria agallocha (Fig. 16.7), Osbornia octodonta (Fig. 16.8) and Rhizophora stylosa. 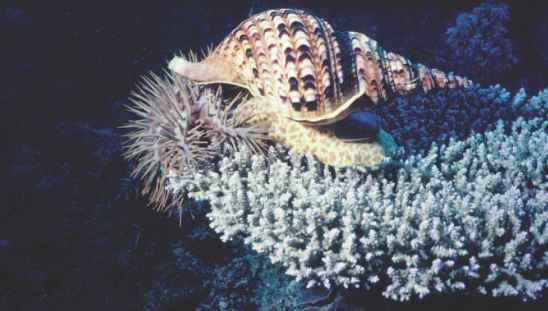 Only R. stylosa and A. marina are considered major dominants. All species of this group are generally described as less climatically sensitive. Their wide ecological amplitude makes them tolerant of a wide range of salinities from seaward exposure to periodic pulses of freshwater. Each species has further individual traits, for example: R. stylosa are confined to the leading edge of the mangrove zone, often fronting the sea and associated with moderate but not extreme salinities; E. agallocha are mostly associated with dry margins; while O. octodonta is characteristically common on sandy substrates. Table 16.1 The 39 mangroves of GBR coastal catchments. Those highlighted in bold are commonly found on islands within the GBRWHA. See the key to differentiate taxa. importance of mangroves, where around 75% of the total seafood landed in Queensland comes from mangrove estuarine related species. These messages clearly indicate that healthy estuarine and nearshore marine ecosystems are biologically and commercially important, and, these natural systems are intimately related, connected and dependent. So, where one is impacted, the effect will be felt more widely than might otherwise be expected. This is the case whether these ecosystems are viewed as sources of primary production with complex trophic linkages, as nursery and breeding sites, or as physical shelter and buffers from episodic severe flows and large waves. These ecosystems and their linkages are seriously threatened. The GBR of Australia, for example, is threatened by another insidious factor in addition to global warming and coral bleaching. This immense and unique natural wonder is seriously threatened by smothering plumes of mud that greatly exceed levels of prior natural flooding. This corresponds with a century of large scale land clearing and conversion of coastal forested wetlands of GBR catchments into agricultural, port, urban and industrial developments. Coastal rivers have become little more than drains transporting eroded mud to settle in lower estuaries, in coastal shallows, and on inshore reefs. Mangrove-lined estuaries have offered some respite and have dampened this effect. In recent years, however, this final bastion of coastal sediment filtration has also begun to succumb to the increasing and unrelenting pressures of human populations that are expanding across coastal and estuarine regions of the GBR catchments.